Words thrown at any topic that gets my fancy. 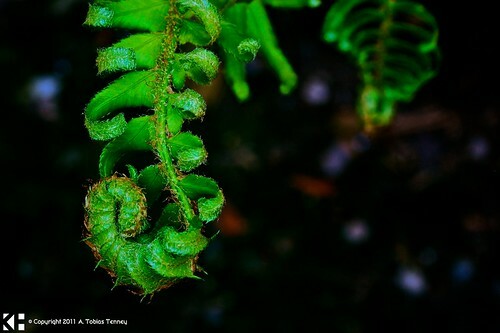 After 127 shots of this fern “branch”, I finally captured what I was looking for. This means that the depth of field is so exceptionally shallow that you have to hop the ƒ stops up just to get the bend of the tiny leaves in focus. As you can tell in this photo, I had to go up to ƒ/14. In turn, this means that I had to make up for it in either shutter speed and/or ISO. Since I don’t want to have anything higher than 400 as my ISO, I kept taking shots at exposure rates that would make even the tiniest of gusts of wind blur the furn. Thus, I took 127 shots hoping that at one of those instants the wind didn’t gust the fern. I think that this one optimized the depth of field, kept the noise to a minimum, and still allowed me to get a nice crisp focus. © Copyright 2010-2015 A. Tobias Tenney - All rights reserved. No content on this site may be reused in any fashion without explicit permission.